A must try... simple & easy recipe!! 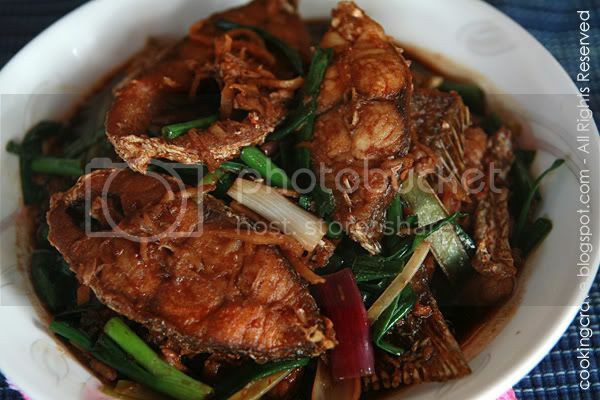 We can use any kind of fish for this dishes. The best I have tasted so far is the baby shark meat. Shark meat are smooth and it taste real good with we stir-fried it this way. Beside that we can use fillet of bigger size fish. Ok, let me share with all of you the ingredients for this dish. Sugar (optional) - I didn't use sugar for most of my dishes. My mom diabetic & couldn't take too much sweet food. Clean & cut the fish into 1cm thick. Fry it with oil until it's cooked but not crispy. Set aside. Slowly and carefully add in the cooked fish. 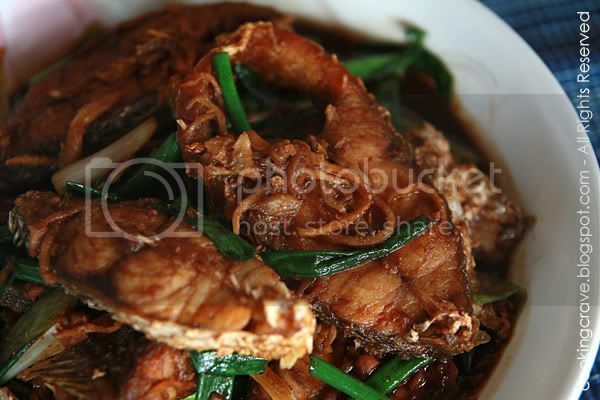 Stir the fish to mix with the bean paste slowly and at this time add in the appropriate amount of the thick soy-sauce. Continue to stir-fry it, do it carefully and don't break the fish into pieces. Lastly, sprinkle in the green onions. Stir to mix it well with the fish. P/S: If you love it spicy. Add in some chili chunks at the time we add the green onions. oh, so yummy, i very often cook Char Hu too, must post it up one day, Thanks for remind me. I enjoy this dish every time! With lots of fried ginger and lot of green onion. yum yum! It's a dish that reminds me of my mum's cooking back in Malaysia. Thanks for sharing! Thanks Camelia & Sonia for drop by my blog..